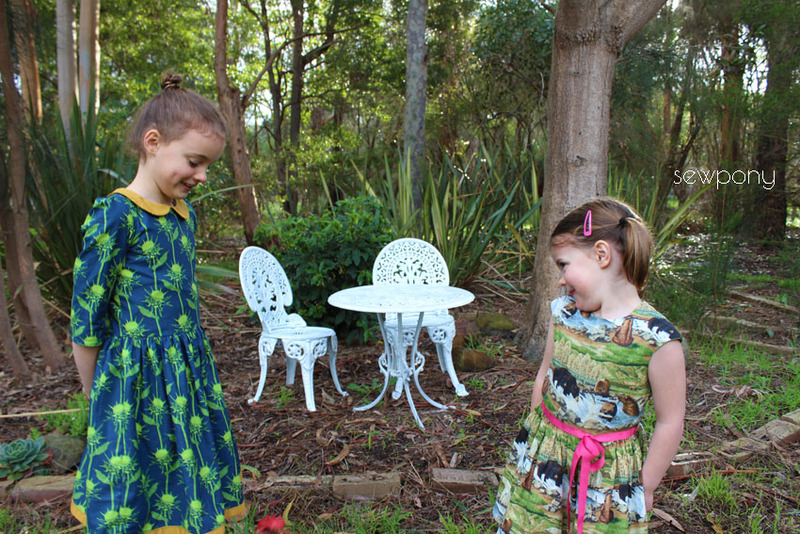 Today I am sharing two dresses I made that are 'Anspired'. Today I am among great company in sharing a creation that is inspired by An of StraightGrain. An is one of my favourite bloggers and has become a good blogging friend whom I have known know for a few years. I love An's style and find myself often choosing fabrics, trims and designs that have an element of her style in them. 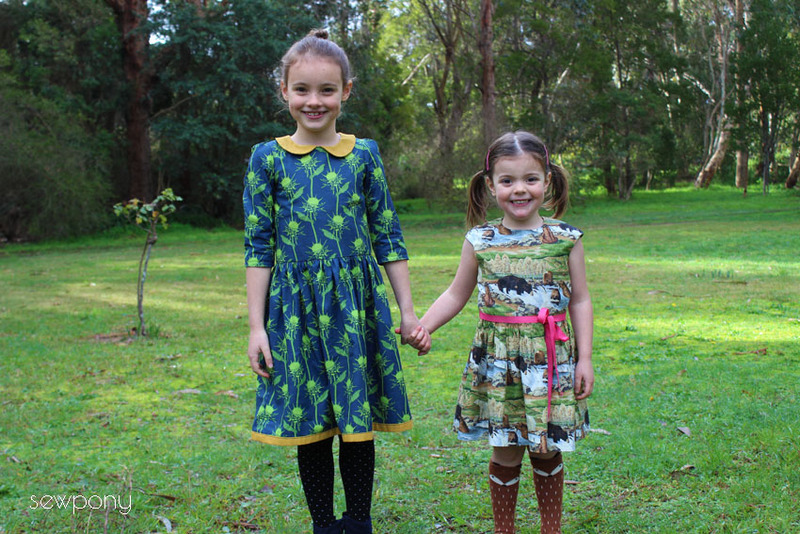 An makes gorgeous clothes for her two daughters and loves many of the things I do too - mustard accents, mint and soft pink, print mixing, neon piping, fitted bodices, invisible zip, landscape prints and cute details. I contacted some lovely sewing friends to see if they would like to participate in this little tribute sewing project and they were all very excited to join in too! Marleen, Ana Sofia, Mieke, Rachel, Maaike, Annick, Trine, Marta, Griet, Sylvia and Jenya are all sharing today too! 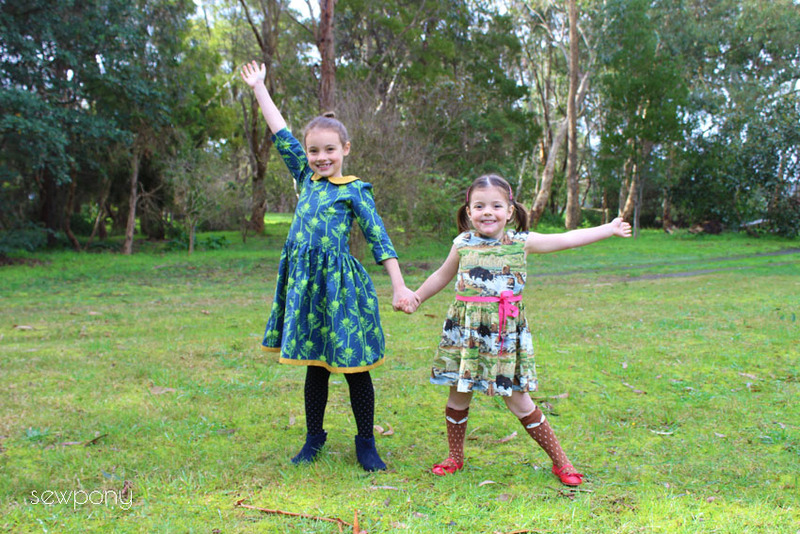 For this project I made two dresses - one for Emily and one for Isabella. 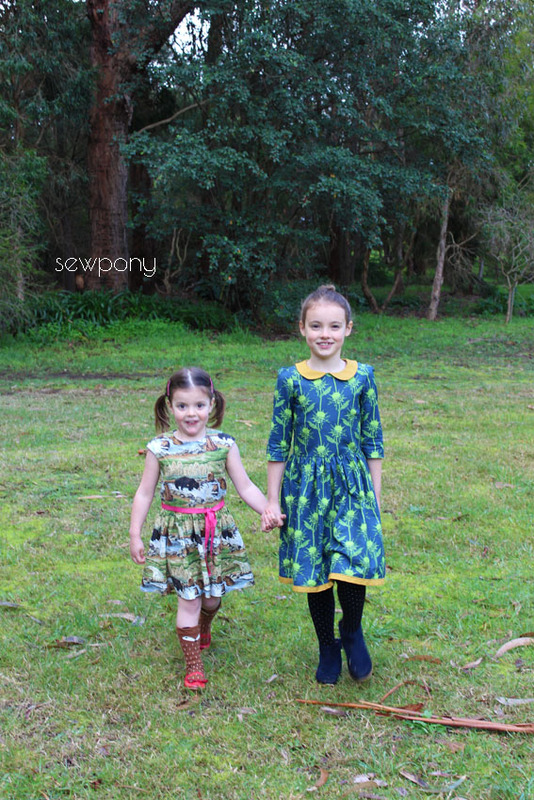 Emily's is a landscape inspired dress while Issie's is a more elegant dress with mustard accents. 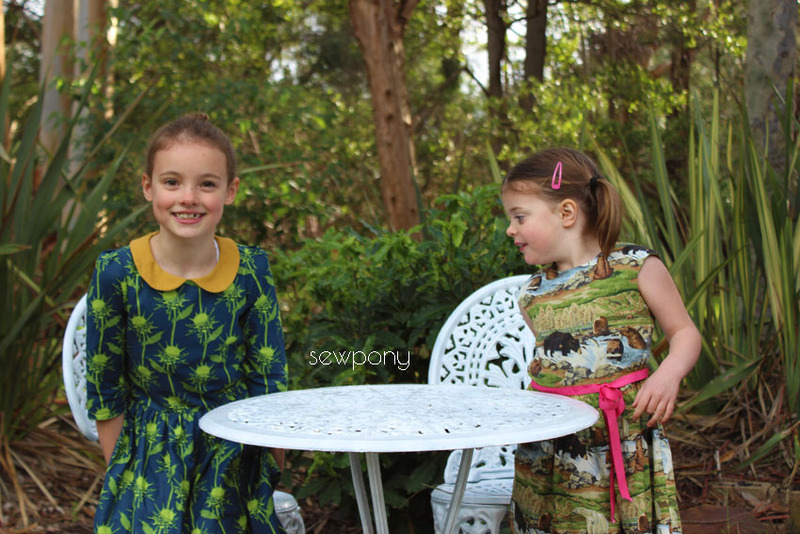 I used an's Tinny pattern for both dresses (you might have guessed that I love this pattern!). Emily's dress incorporates one of the elements listed above that An introduced me to years ago through her creations is that of landscape prints. By this I mean prints that depict landscapes that you might see in life - trees, mountains, cows, deer, bears, swans in their environment. This is a very Belgian look and I love it! 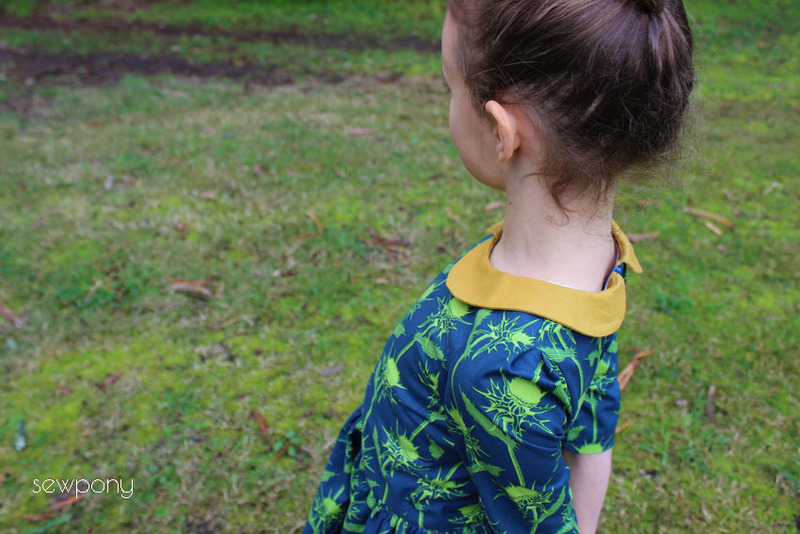 My first landscape dress was An's first Tinny dress pattern. Juliette wears this dress now and we still love it. I have made this dress which was made from Bambiblauw fabric which An sent me, and now this dress using this type of print. These fabrics are not easy to find here in Australia, so when I found this bear print in the quilting section at Spotlight, I thought it would make a fantastic Anspired dress! I used An's Tinny dress pattern for Emily's bear dress. I used the extended cap sleeve version with the gathered skirt. I added a bright pink cross grain ribbon tie - An loves to add ties and I like the contrast and fun this brings to the dress. 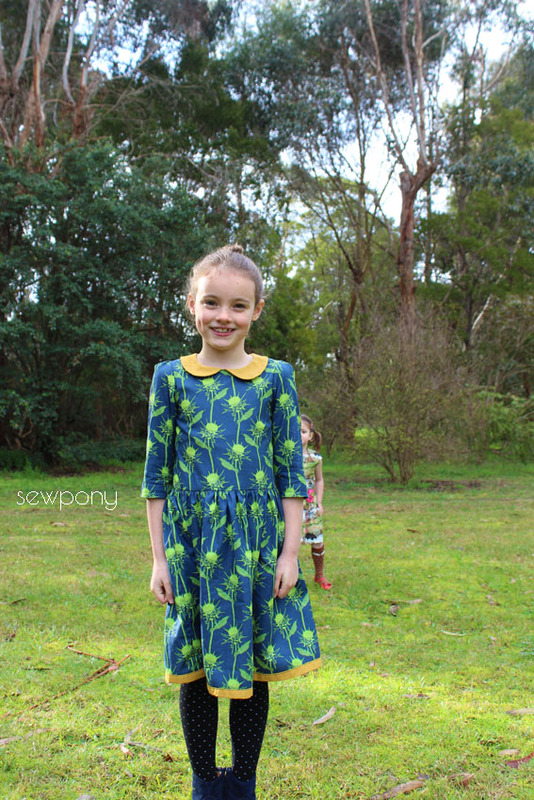 Isabella's dress was also made using An's Tinny pattern. This time I added the collar and extended the sleeves to three quarter length. The beautiful fabric I used is called Mary Thistle. I bought it here - although they only stock the other four colourways at the moment. I paired it with An's favourite accent colour - mustard! Make sure to check out what the eleven other lovely bloggers who are also inspired by An to see what they have made. You can also check out #anspired on instagram to see more. Happy 1st of July An. Keep creating and inspiring...we love what you do! Two dresses - of course you did! They are both beautiful - well done, my friend. I adore the dress you made! Now I want to copy you! Great idea Suz!I love how an ispired us all in a different way! 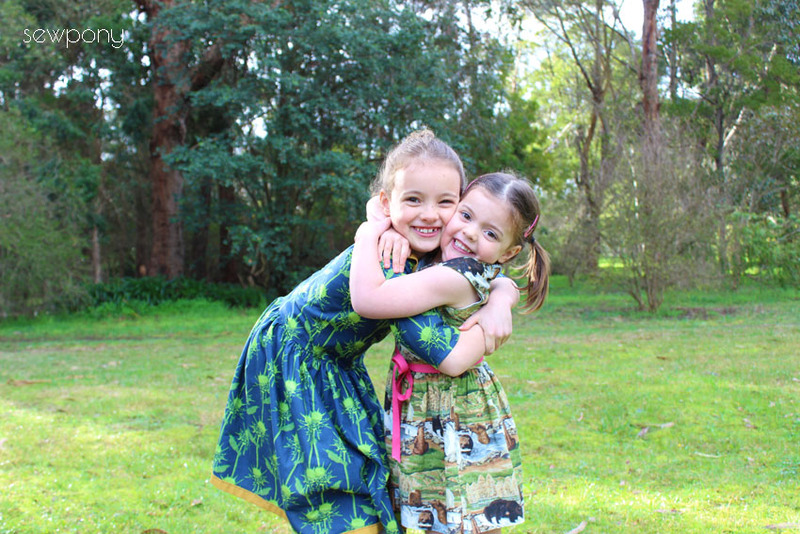 Very cute dresses you made! Suz, thanks so much for organizing this! I am so glad we were able to honor An for the amazing person that she is! And your dresses are beautiful. I always love looking at your photos. Your girls always look like they are straight out of a vintage photo! Also, another sewing blogger was over at my house yesterday and commented on the awesomeness of your Cosi swimsuits which my girls were wearing! Oh that's lovely Rachel ~ thank you! Dear Suz, thank you SO much for what you did! I was completely surprised, shocked and moved by #anspired. I've been walking on clouds for the entire day yesterday, and I still can't believe today that 12 super talented bloggers did such an amazing thing for me. You are such an amazing and sweet friend! And your creations... where do I start? 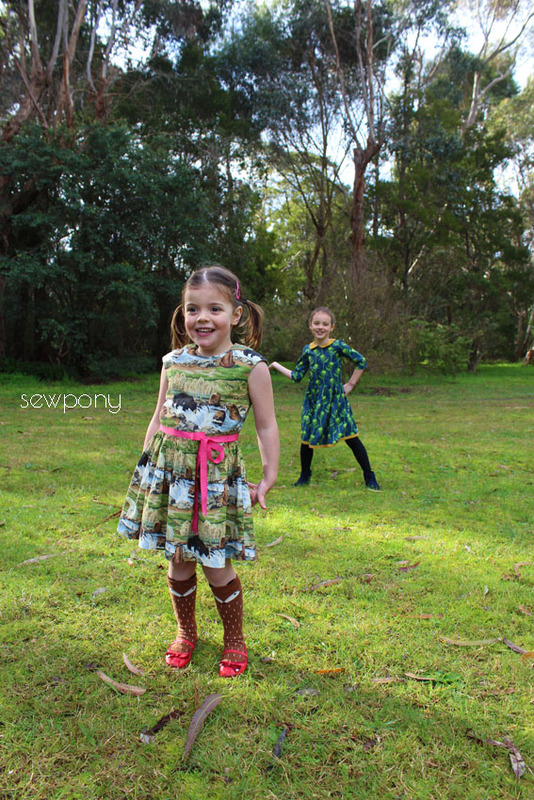 They are so stunning and creative; so Sewpony and so StraightGrain at the same time! And your girls are such a sweet pair! Those two dresses are gorgeous. Great color combinations and styling.